Copper Sebacate — a little goes a long way. 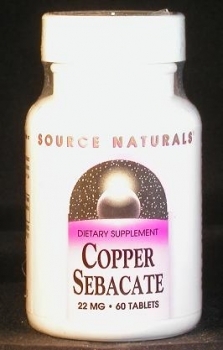 Copper sebacate is an especially bioavailable form of copper. maintenance of connective tissue and joints. Although severe copper deficiency is rare, the diet of many Americans supplies less than the RDA; so, moderate deficiency is common. Possible symptoms include loss of color in the skin and hair, anemia, inflammation, arthritis, weakening of connective tissue, cardiovascular damage, and impaired immunity. If you have any of these symptoms it wouldn’t hurt to try a bottle of copper sebacate to see whether a copper deficiency is responsible. Copper is an essential cofactor in a number of enzymatic reactions with varied physiologic roles. These include melanin production (hair and skin color), wound healing, and red blood cell production. Copper is needed in some antioxidant enzymes that prevent damage from free radicals and inflammation. It appears to be particularly important in the maintenance of connective tissue and joints. Although severe copper deficiency is rare, the diet of many Americans supplies less than the RDA; so, moderate deficiency is common. Possible symptoms include loss of color in the skin and hair, anemia, inflammation, arthritis, weakening of connective tissue, cardiovascular damage, and shortage of white blood cells.